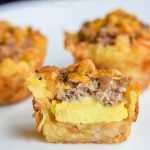 These sausage egg and cheese breakfast tots are an easy brunch recipe filled with everything you love about breakfast! Brown sausage in a skillet over medium high heat. Once meat has browned drain the grease then add sausage and cream cheese back to the skillet and cook until fully combined. Set aside. In a skillet scramble the eggs and set aside. Fill the tater tots with a small spoonful of eggs (about 1 teaspoon) and then place 1 teaspoon of sausage on top of the eggs. Remove the breakfast tots from the oven and sprinkle with a little cheddar cheese then return to the oven for another 2-3 minutes or until cheese has melted. Remove breakfast tots from the oven and let cool for 5 minutes before removing them from the muffin pan.